The bill sent to Gov. Larry Hogan would enable the attorney general to bring civil actions against manufacturers of off-patent or generic drugs that make an "unconscionable" price increase — described as an excessive increase unjustified by the cost of producing or distributing the drug. ANNAPOLIS, Md. 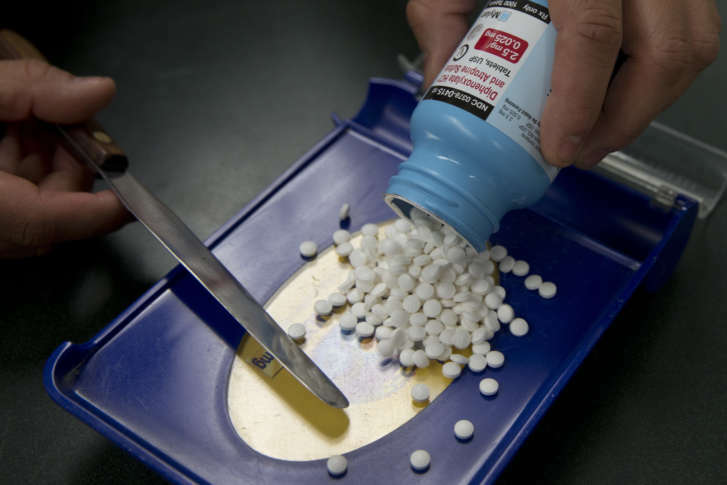 (AP) _ Maryland would be the first state to empower the state’s attorney general to take action to stop pharmaceutical price gouging, under a measure given final passage by lawmakers on Monday. The bill sent to Gov. Larry Hogan would enable the attorney general to bring civil actions against manufacturers of off-patent or generic drugs that make an “unconscionable” price increase _ described as an excessive increase unjustified by the cost of producing or distributing the drug. “When a drug company doubles or triples _ or multiplies by 50 _ the price of medication, it imperils the health and finances of patients and their families, and it threatens public health,” said Democratic Maryland Attorney General Brian Frosh. Manufacturers could face a fine of up to $10,000 per violation. The attorney general would be able to request additional information from the corporations that instituted the price increases to help determine if price gouging has occurred. “The new law will give Maryland a necessary tool to combat unjustified and extreme prices for medicines that have long been on the market and that are essential to our health and well-being,” Frosh said. Concerns about sky-high drug prices have been building for years nationally. They boiled over last year after it was revealed that Turing Pharmaceuticals and Canadian drugmaker Valeant Pharmaceuticals were hiking prices on previously low-priced medicines for patients with heart problems and other life-threatening conditions. Still, Congress has been unable to act. Doug Mayer, a spokesman for the Republican governor, said Hogan will review the bill before deciding whether to sign it. The Democrat-led legislature passed the measure with bipartisan support in both houses, more than enough to override a veto by the governor. The vote was 38-7 in the Senate and 137-2 in the House. Vincent DeMarco, president of Maryland Citizens’ Health Initiative, said the problem of price gouging has been going on for too long, and it’s time for states to do what the federal government has been unable to tackle. The group describes itself as a coalition of hundreds of faith community, labor, business and health care groups that works for quality and affordable health care in the state. “Our health care advocate colleagues all across the country have been calling us to ask how they can replicate what we just did,” DeMarco said after the final vote Monday. Critics say the measure will chill competition among generic drug manufacturers and end up making drugs more expensive. Chester Davis, president and CEO of the Association for Accessible Medicines, urged the governor to veto the measure. “This bill will harm both Maryland patients and taxpayers alike and thus should be vetoed by Governor Hogan,” Davis said in a statement. Dr. Jeremy Greene, who practices at the East Baltimore Medical Center, praised the legislation. He said he sees patients who have trouble affording off-patent drugs every month. “I find myself seeing evidence of these problems repeatedly in my clinical experience and increasingly in the past five years,” Greene, a professor of the history of medicine at Johns Hopkins University School of Medicine, said Monday.